Bioware Ireland, a division of video game company Electronic Arts, is opening a customer service centre in Co Galway. THE TAOISEACH Enda Kenny will today open a new customer service centre in Co Galway which is expected to create 200 jobs. Bioware Ireland, a subsidiary of the video game company Electronic Arts, is setting up the new centre at the IDA’s Business and Technology Park in Parkmore West, Galway. Around half of the centre’s jobs have already been filled, it is thought. The centre will be used to provide customer support for players of one of EA’s major new releases, Star Wars: The Old Republic. The opening of the new centre will also be attended by BioWare’s co-founders Ray Muzyka and Greg Zeschuk. BioWare said it had chosen Galway as the venue for its first European customer support centre because of its recruitment opportunities and technological infrastructure. 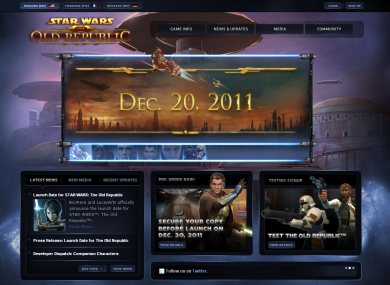 The Star Wars game, which is being released in the days before Christmas, is a multiplayer online role-playing game set in the same universe as George Lucas’s blockbuster movies. It has been in development for three years. EA said it had received 200,000 pre-orders for the game within the first six days of accepting them, some three months before the game’s full release – more than for any other game in its history. Email “EA subsidiary to open call centre with 200 jobs”. Feedback on “EA subsidiary to open call centre with 200 jobs”.